More newly constructed homes are hitting the market—welcome news for home buyers frustrated by the ever-worsening lack of abodes for sale. But are they enough to ease the housing crunch? 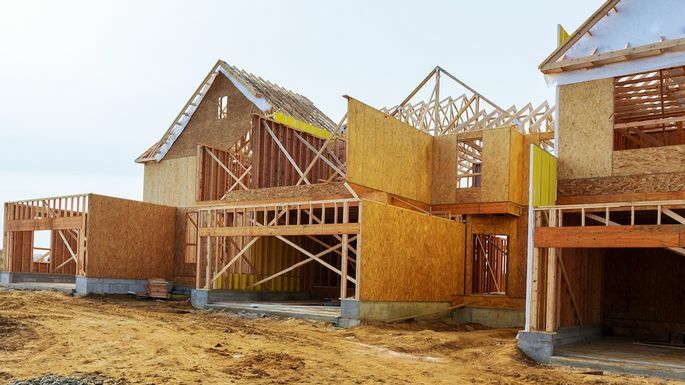 Builders completed a whopping 1,291,000 new homes in May—that's the most in more than a decade, according to a joint report on new construction by the U.S. Census Bureau and the U.S. Department of Housing and Urban Development. There haven't been as many homes completed in a month since January 2008, when 1,331,000 homes went up. The number of finished new homes was also up 1.9% from April of this year and 10.4% from May of 2017. “Construction is moving in the right direction. But it's still below what we need right now," says realtor.com® Chief Economist Danielle Hale. "People who are in the market will find these housing completions will make a difference ... but it's still going to be competitive for buyers because there's still not enough." She pointed out the housing market needs about 1.25 million new single-family homes completed annually to meet demand. And the market is still about 30% below that. However, just adding more new homes isn't a cure-all for the housing market. New homes were significantly more expensive than existing (i.e. previously lived-in) ones by about 21.1% in April, according to the most recent Census and National Association of Realtors® data. New homes cost a median $312,400 in April, compared with $257,900 for existing abodes. That's because land, material, and labor costs are rising and regulatory issues can cause costly delays. But the near future of construction looks positive. The number of permits issued to put up new residences dropped 4.6% from April to May to hit 1,301,000. But they jumped 8% compared with the previous year. Permits are a good indicator of new construction activity in the next few months. Permits to erect new single-family abodes dipped 2.2% month over month, but were up 7.7% year over year. Builders received 8.5% fewer permits to put up multi-family buildings (apartment, co-op and condo buildings with with five or more units) in May compared to April. But they received 9.1% more permits to put up these buildings than year earlier. Housing starts, which is construction work that has begun but is not yet completed, rose 5% from April to May and soared 20.3% year over year. Around the country, the Northeast saw the biggest monthly bump in new permits awarded to builders. They were up 42.1% from April and 8.9% from May of 2017. However, the overall number of permits, 135,000, was the fewest granted in any region. Permits were also up in the Midwest by 7.2% month over month and 17.4% year over year to reach 209,000. The region saw the largest annual gain. In the South, permits fell 13.9% from April, but were up 4.9% compared to a year earlier. The region had the most new permits granted to builders at 626,000. Permits were also down in the West by 4.6% month over month. But they were up 8.2% year over year to reach a total of 331,000. "The Midwest region experienced the biggest gain and hence the region will remain more affordable," NAR's Chief Economist Lawrence Yun said in a statement. "The more unaffordable West region will continue to experience an intense housing shortage, as both housing permits and housing starts fell in that region."